The location was great and the staff very friendly. Everything was really clean. The matress and cushions are in very good quality. It was really a great place to stay and the price not to high for such a location. Breakfast with view was really nice and the fresh jacuzzi very relaxing after a day visiting. The view was amazing from the room and balcony. Not too much stairs to access the rooms in the hotel. We stayed in the room Andreas of the hotel and it was really amazing. Specially the sunset view from the balcony. Highly recommended for all type of travellers, decent breakfast, good value for money, probably the best in terms of moderately cheap accommodation with the best view in whole of Santorini. The staff is fantastic, Maria is so kind and helpful, good service. The view is fantastic! So is location (not too busy but not isolated). Easy walk to Fira. Beautiful breakfast on private balcony. First and formost the location. Right in front of the sea there are only few more places which will offer that great view (and they all were very costly). Room was clean and well equipped, extra towels whenever needed, breakfast provided on time on all three days basis our requirement. That small pool was heated for one day when requested. Host was available to share all the required information for sight seeing or shopping or eating out. This is located at a quite place, slightly away from the crowd which makes it even better. You hardly walk for 2 minutes and food joints and couple of shops available which provides all the basic stuff. Fira is just 10 minutes walk away so eating out or shopping wouldn't be an issue. A great sunset point is also 3 mins away from this place. So while Fira is the most popular place, this is quite and provide a unique calmness and peace. Amazing views from our private balcony. Excellent location, not too many steps to get to the hotel. Very nice breakfast brought daily to our private balcony outside the room. Everything in the fridge, and a carafe of vinsanto wine was complementary. My fiancee and I had an incredible time in Santorini and absolutely loved our stay in Smaro Studios. 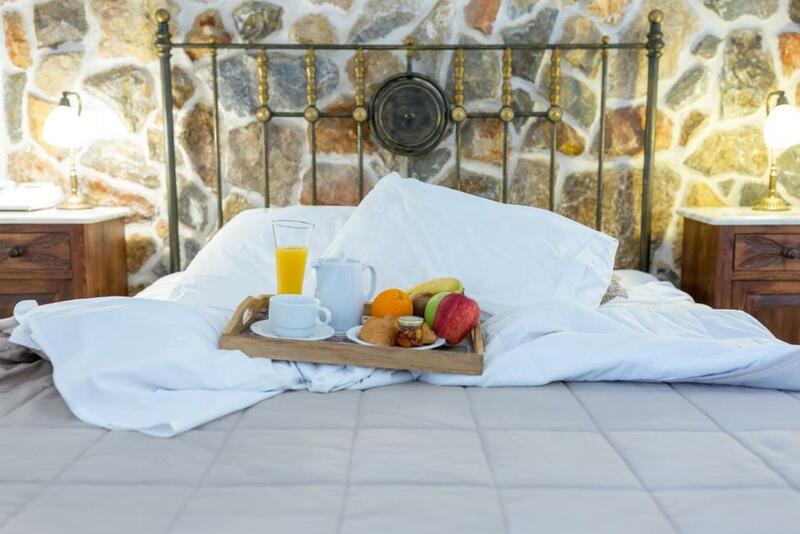 The apartment was spacious, the bed was comfortable, and the breakfast served on the rooftop patio with a view of the Caldera was breathtaking! Great hospitality. Our host was very friendly checking us in, gave us a great overview of room amenities, and brought us a huge breakfast tray every morning. Incredible view. Lovely breakfast, great view of sunset and very convenient location. "Very nice staff. Very large room with separate kitchen and sitting area. Lock in a great price for Smaro Studios – rated 9.3 by recent guests! Smaro Studios features air-conditioned apartments with volcano views in the picturesque Firostefani. There is a 5-person hot tub in the communal terrace and free Wi-Fi access is available throughout. Each carefully restored apartment features traditional furniture and marble floors. They all include a coffee maker and complimentary breakfast essentials, as well as a safety box. A rich breakfast is served each morning at the rooms’ balcony and includes eggs, jams, toast and pancakes. A bottle of Vinsanto wine, mixed nuts and fresh fruits are offered upon arrival. Smaro’s front desk is open from morning until 22:00 and offers tourist information and car hire service. Island tours can also be organized here. When would you like to stay at Smaro Studios? This studio has a satellite TV and hot tub. It provides access to a rooftop balcony offering panoramic sea views. This studio features air conditioning and tile/marble floor. It provides access to a rooftop balcony offering panoramic sea views. Opening to balcony with unobstructed Caldera views, this air-conditioned studio has a hot tub, a fully-equipped kitchenette and a bathroom with a shower. Opening to balcony with unobstructed Caldera views, this air-conditioned, split-level studio includes a hot tub, cable TV and a bathroom with a shower. Opening to balcony with unobstructed Caldera views, this air-conditioned studio includes a satellite TV, seating area and a bathroom with a shower. Located on the top floor, this studio has a seating area, kitchenware and air conditioning. 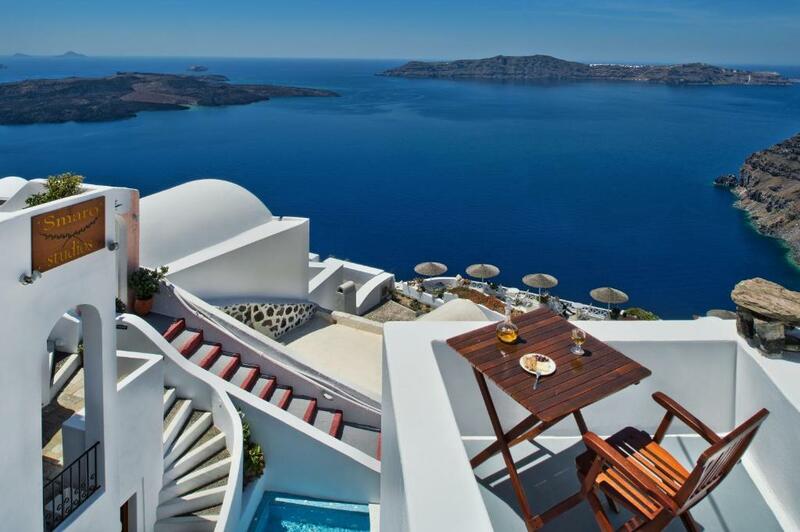 It opens to a balcony with sea and Caldera View. Grandma Smaro first saw her house in Firostefani as a bride Here she heard the cries of her first three children, Dimitris, Andreas and her only daughter, Katerina, and here she watched them grow. It remained her home until its devastation in 1956 by Santorini's last great earthquake. Grandma Smaro took the remains of her dowry, a few black and white photographs, and left the ruins of her home with her husband and children. Smaro Studios Santorini is on the Caldera cliffs. 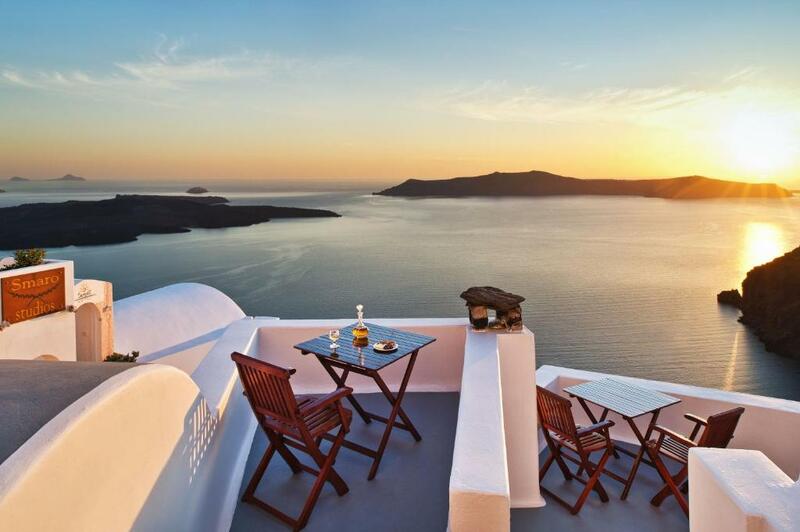 A small hotel with a big history, Smaro Studios has a wonderful view of the Caldera, the volcano and the gorgeous Aegean Sea. 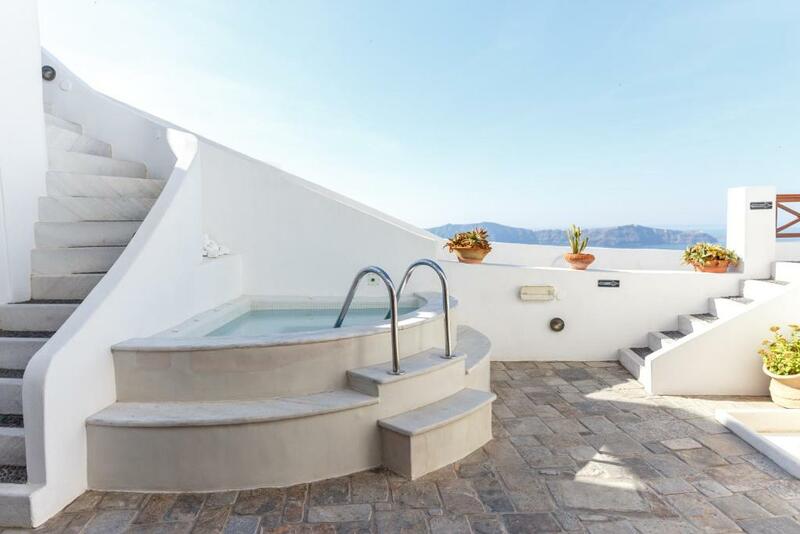 The hotel is located in Firostefani, a peaceful village just above Fira town. Smaro Studios combines hospitality and relaxation with the enchanting traditions of a beautiful Greek island. House Rules Smaro Studios takes special requests – add in the next step! Smaro Studios accepts these cards and reserves the right to temporarily hold an amount prior to arrival. Honeymoon guests are offered a traditional homemade cake and welcome drink. 1) Fairly less counter space available with the current furniture set up. we were a family of 3 - all members have something or the other that they need to keep on the tables - ie ipads , phones, watches, camera's, makeup , jewellery, perfumes, hats etc . Not enough counter space for all 3 of us. May be Ok counter space for one guest or a couple. We were vegetarian guests. Our request for veg breakfast was catered for - but all 3 days it was almost the same breakfast... we were cool about it cos of our dietary restrictions, but would have been nicer to hv some variety. We had an incredible hospitality experience. The view, the location and most importantly - the welcoming and supporting service and attitude. We felt right at home in the most beautiful place in the world with front row seats to it. Coffee could be stronger, but what are we even talking about? Staff was extremely kind and helpful; they helped us with first aid after my wife induced a minor leg injury, served a great breakfast with insane caldera views and played with our infant child. Rooms were clean, Santorini sweet wine and a beer included, arranged our airport transfers and overall very relaxed atmosphere, including a cute white cat. the stairs can be a bit of exercise for travelers with heavy luggage. With the transfer we would have liked some help with the baggage. Everything about Smaro is amazing. The views, the rooms, the hot tub! Breakfast is good with a nice selection, made fresh when you want it. Hotel is perfectly located for all local attractions, nightlife and restaurants. Great views to the caldera. Bus stop Firostefani only 5min walk and Center of Firá 15min. Cosy room with AC. One highlight was the breakfast on the balcony with the caldera view. We had a few issues with the shower pressure during our stay, but from talking to friends this is an issue right accross the island (understandable) a call to reception and it was quickly fixed. Breakfast each day was very nice. Great selection and very tasty. The views from the Giorgios room are exceptional. best view. great breakfast. helpful staff.